Bound for Caramoan in Camarines Sur, me and my friends decided to try the train service between Manila and Naga City (then Naga to Caramoan via bus and boat) since it was recently reopened by the Philippine National Railways. Bicol Express, as the service is called, has a rich history that goes back all the way to 1875. PNR was called Ferrocarilles de Manila-Dagupan then, and it first served the Manila to Dagupan route to the north. A line going south to Bicol region was later established, in 1931. I was excited because it would be my first train ride in the Philippines (not including the mass rail transit systems in the metropolis), and the first that would take more than an hour. According to the website, the trip to Naga would take about 10 hours: from 6pm to 4am the next day. The hardest part of our journey using the Bicol Express was actually the one with the shortest leg: the trip from the LRT 2 Station in Recto going to the PNR station in Tutuban, Manila. The distance between the two is just a few kilometers but it means passing through a very crowded market area in Recto/Divisoria and along some squatters colonies that might be unnerving for someone who's not a local. We have several options to do this: either take a jeepney to Divisoria and walk to Tutuban from there, or take a cab, which we figured would be difficult to get in Recto. So we took the third option: a kuliglig - an improvised kludge of a tricycle that uses a pumpboat engine. They can be found right next to the Recto station, waiting for passengers. We negotiated with the driver (PhP 100 for 2), who took us through side streets and along squatter colonies to bring us to the train station. Initially I called up PNR to reserve tickets for the trip. They only have 2 trunkline numbers for reservations and it is kind of difficult to get through. I managed, and I was able to talk to an operator, who sounded like a typical bored bureaucrat. He took our names and the details of our departure and told me that I will receive a confirmation call within 2 days. I didn't; the reservation system is tedious anyway. You need to buy the tickets 2 days before the trip, in Tutuban, from 2pm to 5pm only. Since I can't go during the weekday, we gambled and said that we will just get the tickets on the day of the trip. The tickets aren't expensive: PhP 665 for a sleeper (This means that you'll have a bunk bed to sleep on, and there are 4 beds to a cabin. The executive sleeper, for about a thousand pesos, will give you a room with a single bed, but it is not available in our train. The ticketing is not automated. The cashier takes a long time to write the stubs, and it took us about an hour to get the tickets. We were advised to bring food and drinks aboard, as there are no restaurants or stores in the cars. With about an hour to kill, we went to the nearby Tutuban mall to get an early dinner and buy provisions. The blue-colored train itself - No. 611 - is a bit old and looks rundown from the outside. It still has some Japanese markings and instructions on it, a vestige from the country who donated the cars to the PNR. 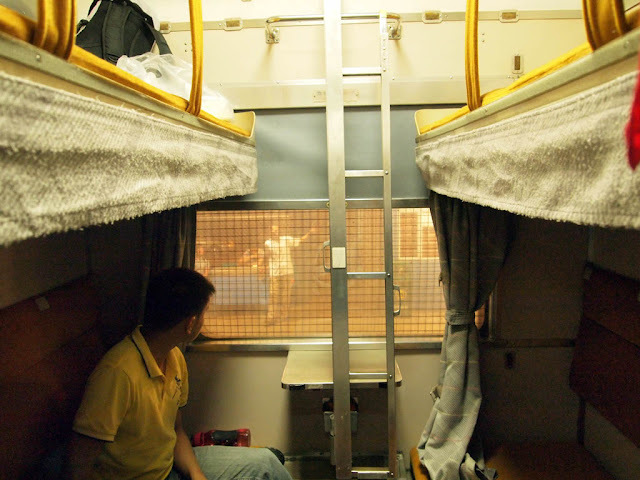 One thing I noticed: They installed screens on the windows, accordingly, to protect the passengers from mischievous squatters living along the tracks who made it a sport to hurl rocks and other unmentionable stuff to passing trains. The cabins are adequate. The bunk beds are positioned opposite of each other, each with a curtain for privacy, and a light. The top bunks are accessible via a collapsible ladder. There is also a shelf on the top bunk where you can put your luggage. There's a toilet at the end of each car. They are clean, but water pressure is not good so they flow out in trickle. 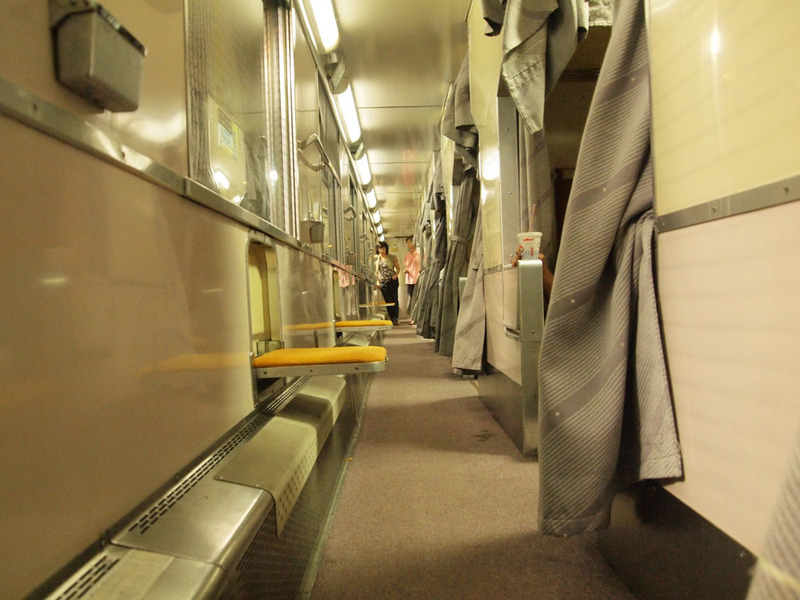 The car where the sleepers are is air-conditioned. Surprisingly, the train left on time. Starting from Tutuban station, it passes through several stations in Metro Manila, then to the towns of Calamba, San Pablo, Lucena, and Hondagua all the way to Naga City. The ride feels like you were sailing on a rough sea, but it is not unpleasant, unless you have a history of motion sickness. If so, you might need to take Bonamine before boarding. Around midnight passengers would start withdrawing to their beds so there's not much to do except catch a nap. The screeching of the brakes from an occasional stop can be a bit jarring and could wake you up if you're a light sleeper. The journey though, took more than 10 hours, as we arrived in Naga around 5 am. This is partly because we have to stop halfway during the trip so they can repair something (all the lights went out and we stopped for about 30 minutes). All in all I would say that it wasn't an unpleasant experience. Compared to the alternative - a 10-hour bus ride amid the traffic and the frequent bus stops - taking the train is better, as you'd have the chance to sleep and wake up in the your destination a bit fresh. 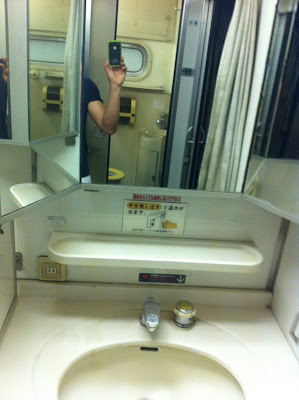 The cabins and beds are OK, and there's a minimum set of comfort that you get from the service. How to Get to Tutuban Station: You can either take the LRT 2 (Purple Line) all the way to Recto station, and take a jeepney (or you can walk) to Divisoria/Tutuban area. The station is just behind Tutuban mall. You may also take a kuliglig tricycle from the LRT 2 station that will bring you directly to Tutuban station. If you are taking the LRT Line 1 (Yellow Line), get off D. Jose station and take a jeepney at the corner of Rizal and Recto Avenue.